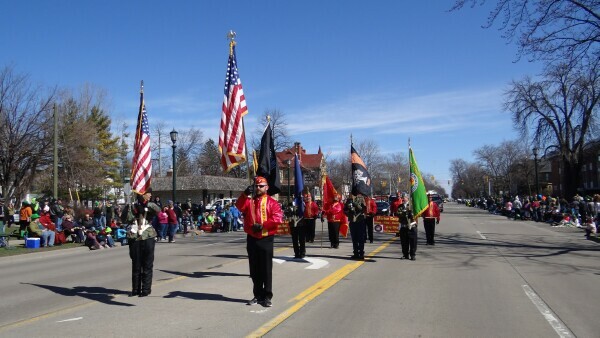 Today was a "twofer" combining the First Day of Spring and the 62nd annual Bay City Saint Patrick's Day Parade. As usual, the Citizens of our fine city were out by the thousands to celebrate the day and just have a great old time! In many ways, it was a mirror of last year's parade. The temps were almost exactly the same, with bright skies and light wind. This reporter was facing into the light breeze as he walked against the grain taking pictures or the parade and crowd. The light jacket and vest, plus a knit hat, felt pretty good. After a little more than a mile and a quarter it was time to turn around and boogie back downtown. Going with the wind it didn't take long for the "hat" to come off. By the time I was back at the MyBayCity.com office by the county building, I was sweating. Last weekend, parade organizer Jan Rau was the speaker for the Bay County Historical Society's monthly (free) Second Saturday talk. Because the Museum staff was at the Planetarium putting on the regional Michigan History Day, Jan's talk was held in the big theater with slides projected on the huge dome. It was a great program with lots of good pictures from the last 62 years and many fun stories... for example. Did you know there has been more than one wedding held in conjunction with the parade? After one of these weddings, Jan said the newlywed couple was to ride down the parade route in a white carriage pulled by a horse. As it turned out, the horse selected was a draft animal and just a little too large for the carriage. He got excited and in short order broke the traces. "Well, it's pretty easy to walk a horse off the parade route, but not so much to get a carriage out of the way," Jan said. Fortunately, some enterprising parade volunteers had just the solution. They all grabbed the carriage tongue and proceeded to pull the carriage the rest of the way with brute manpower. As a point of interest, Jan Rau is also a key organizer of the River of Time held as the last festival of Bay City's summer. She seems to kick things off in the Spring and wrap it all up in the Fall. We didn't see any problems this year's parade. Everyone seemed to have a great time and things came off just fine. Enjoy this collection of photos from the day and send a link to your friends and relatives. MyBayCity.com is read worldwide. It's fun to show others how we enjoy ourselves each spring.